The Robert Maxwell of Victorian England was Jabez Spencer Balfour. 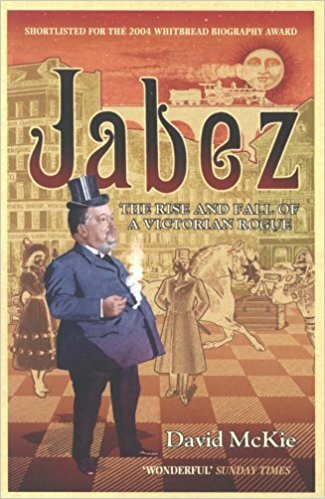 Jabez, as he was universally known, was a business man, philanthropist, politician, temperance campaigner charmer and, according to a contemporary commentator in The Times, ‘one of the most impudent and heartless swindlers on record’. He was also an astonishing rogue – a liar, adulterer and cheat – who perpetrated the most destructive fraud of the nineteenth century. When the Liberator building society collapsed under the weight of its own extravagant malpractice, thousands of people were left defrauded and destitute. Jabez, the Liberator’s moving spirit, immediately took flight to Argentina, accompanied (scandalously) by a female ward half his age. Eventually, a determined Scotland Yard detective caught up with Jabez, and kidnapped him on a high-speed train across South America from whence he was hauled back to justice. David McKie’s account of the rise and fall of this charismatic swindler brings the man and the times trumpeting to life. The story of Jabez proves all too resoundingly that the epic self-destruction of public figures is not simply a contemporary phenomenon: the life of Jabez Spencer Balfour surpasses them all. First published by Atlantic Books (UK) in 2004.